Don't throw away anything because it might be what a garage sales customer is looking to find. Clean out closets. If you don't wear it, get rid of it. If you have older married children, tell them to clean out too. Toys - All toys sell. If toys are broken they still sell to someone who fixes toys. If toys are separated from sets, no problem, they will be bought anyway. It might be the piece missing from the buyers set. People love the Happy Meal toys! Clothes, including washed underwear and socks. Small appliances - be honest as to whether the appliances work. Let the buyer know if the appliance is broken. If it is, tell them what is wrong because buyer might be able to fix it. Old Watches (watches you wind by hand are what the dealers are looking for and are more expensive). Put add in local paper. Mention in the article star items for sale, for example, children's clothes, electronics, furniture, etc.. If the sale is a block sale put on by a Realtor, no need to advertise. 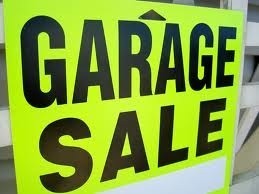 Make signs and hang the day of the sale on main streets near your house. I have found that using flurescent poster board really attracts attention. If you advertise that the garage sale will start at 8:00, you will have customers waiting outside at 6:30. They want to be the first to look at the loot. Have an accounting of your start money. It is usually good to have three $5.00 bills, maybe one ten, fifteen $1.00 bills. In change you will need 1 roll of dimes, 2 rolls of nickels and five dollar in quarters. Write down starting expenses. Your ad in the paper and your starting money. Display of items is important. Large tables, large boxes are good for t-shirts. The shoes should be lined up on the ground. Be kind to your customers and expect the buyers to negotiate prices. It is up to you as to what you want for items. Don't ask too much. At the beginning of the sale don't negotiate too much as the sale has just started. Be ready as the cars park wherever they want. You will have mobs and you will have very slow time too. If you have no had any customers for an hour, you might want to close. It is up to you. During the day call a donation company to pick up remaining items that did not sale. There are veteran organizations, hospital gift shops, thrift shops for the mentally retarded and many others. I have heard that Good Will throws a-lot of items away. Have boxes or large garbage bags to put leftover items in for the donation truck. Be sure a tax reduction slip is left when the trucks pick up. Count your money. Take out the starting fees and divide the remainder up between how ever many people contributed. Good luck and have fun spending your profit!